Looking for an authentic, traditional Mexican dish to serve on Cinco de Mayo? 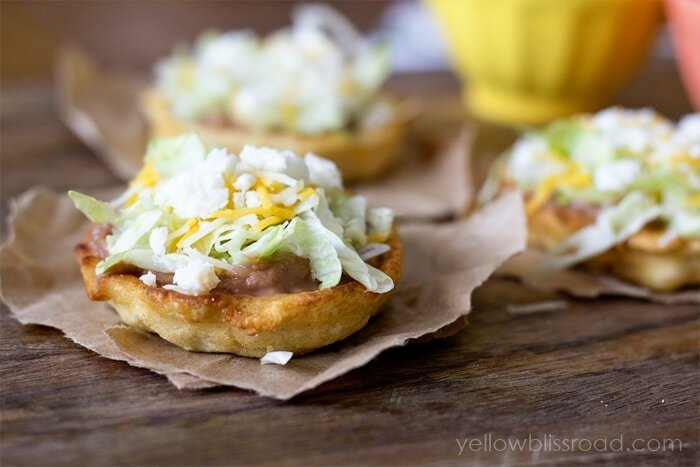 These Mexican Sopes would be perfect! As a bonus, they are gluten free and vegetarian! I’ve mentioned before that my cousin loves to cook traditional Mexican meals, and she’s quite good at it. In fact, my One Pan Mexican Chicken and Rice dish is based off of her recipe, and my super popular Authentic Mexican Rice and Slow Cooker Mexican Beans are hers as well. She lives in southern Arizona, about twenty minutes form the Mexico border, so you can get good Mexican food all over town. However, the very best dishes come straight from her kitchen! 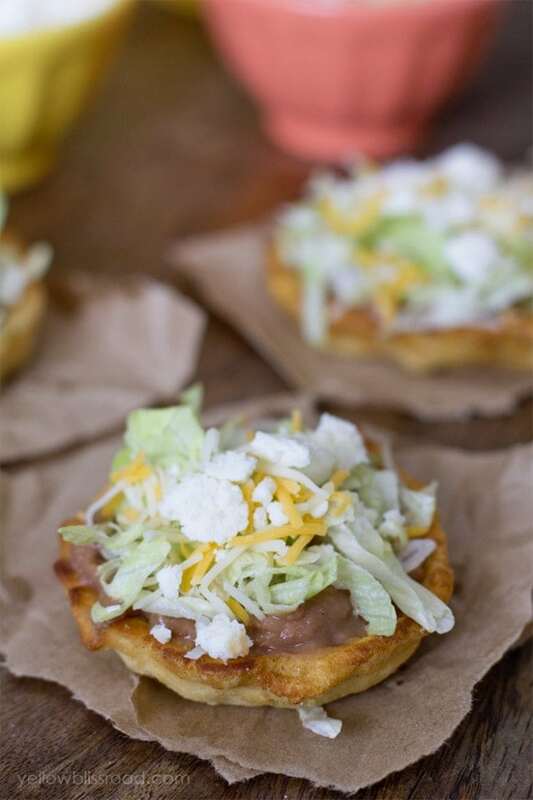 The last time we visited, she made a meal that I hadn’t had before – Sopes. Sort of like a thick corn tortillas. Only way better. Masa and water are mixed together to form a dough, then the dough is divided into golf ball sized portions and pressed into 1/4-1/2 thick inch discs with raised sides, like a shallow cup. 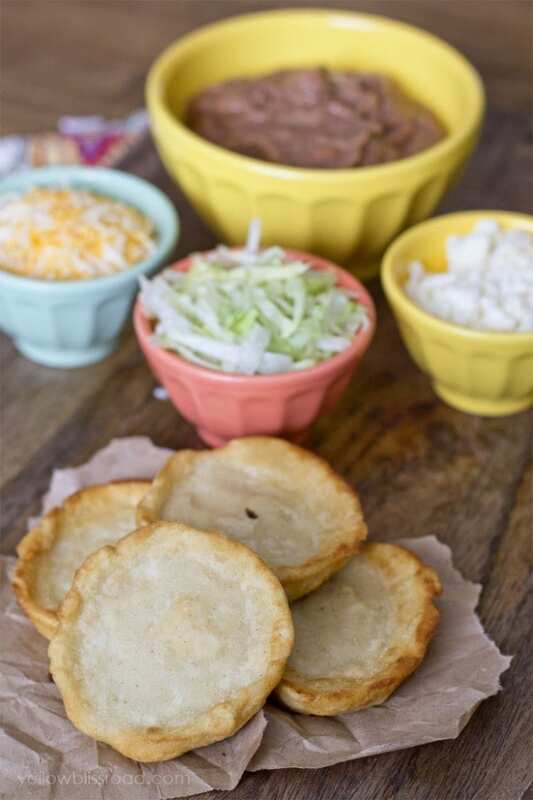 The discs are then fried to perfection and topped with refried beans, meat, lettuce, cheese, and/or salsas. Traditionally a creme is added as well. I have made these little bites of heaven a few times now and it’s about as easy as it gets. 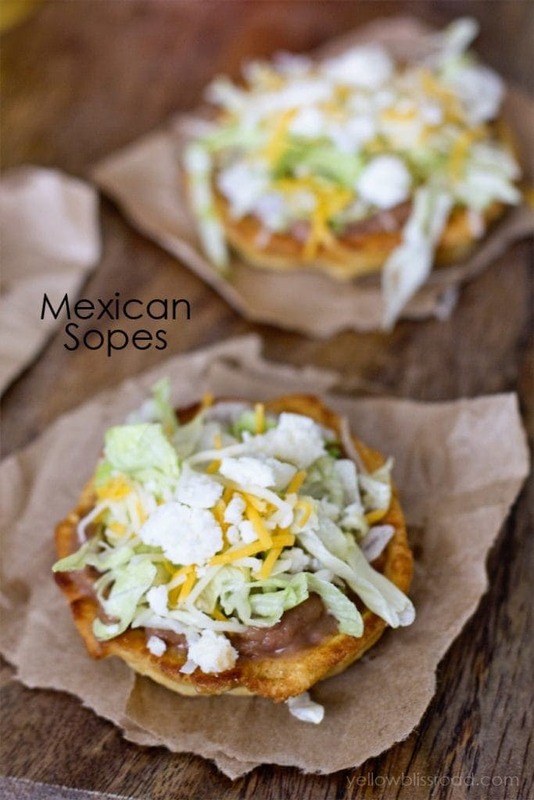 What are Sopes made of? 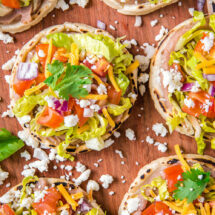 Traditional sopes are made from masa and water. 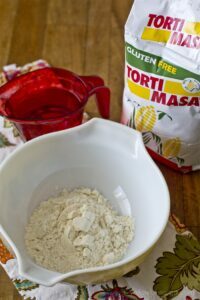 Masa is a corn flour that thickens when water is added. The dough is used to make tortillas, tostadas, tamales, pupusas and more. Masa can be found in the Hispanic section of your grocery store. 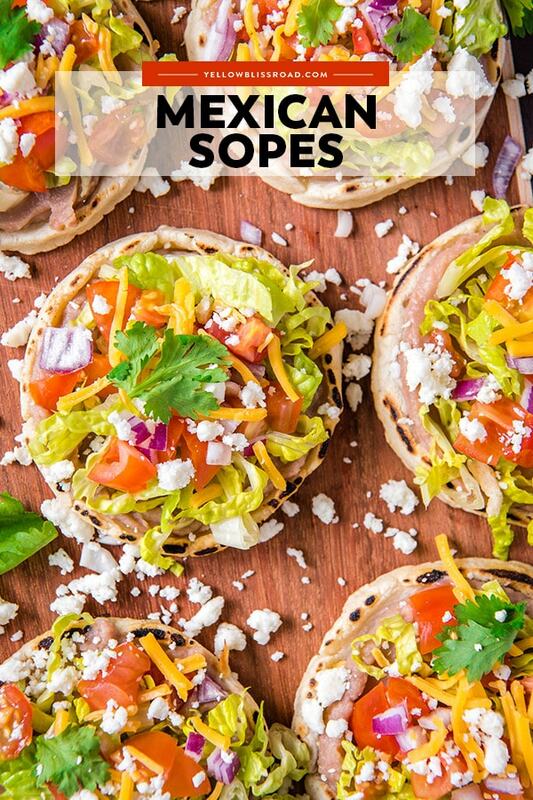 How do you serve Sopes? Sopes will last about a week in the fridge if properly stored in an airtight container. You can freeze them for up to a month. 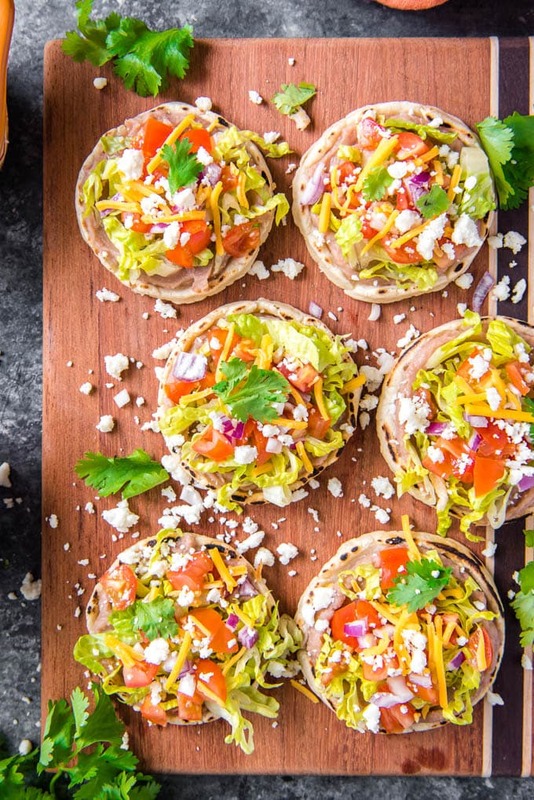 To reheat, place thawed sopes in a single layer on a baking sheet and bake for 10-15 minutes or until crisp. 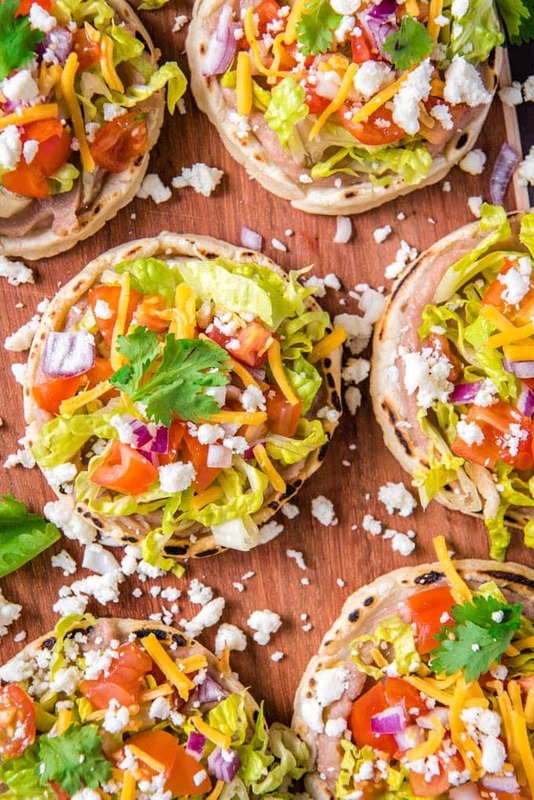 Sopes are made from Masa, which is corn, and they are completely gluten free! Of course you’ll want to take caution with the oil you use for frying and the topping you select. For all Mexican recipe, go here. For all dinner recipes, go here. 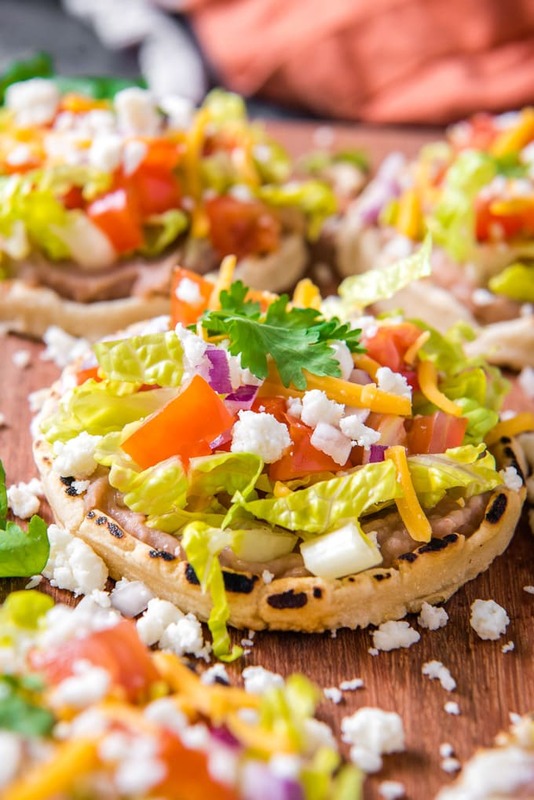 Authentic Sopes are a traditional Mexican dish that's perfect for Cinco de Mayo! Top them with beans, meat and vegetables for a delicious snack or meal. Toppings: refried beans shredded lettuce, cheese, salsa, etc. Stir the masa, salt and water together until a dough forms. With lightly floured hands, knead the dough for a few minutes. Divide the dough into golf ball sized portions and roll unto a ball shape. Press each ball lightly between your hands and then use your fingers to flatten into a 3-inch disc. The dough should be between 1/4 to 1/2 inch thick. Pinch the edges all around the outer edge of the disc to create a raised edge. Keep extra dough in the bowl covered with a wet paper towel to keep the dough from drying out. Heat about 1/2 to an inch of oil in a skillet over medium heat. (You will know it's ready when a drop of water sizzles in the pan). Place masa discs into the hot oil and cook until lightly browned, turning once. The edges should be nice and crispy and the center soft. Hi, so my family has been making sopes for decades in Mexico and in the U.S. and I’d like to throw in the best way to make sopes. 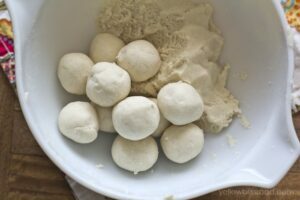 Follow recipe until you get to the rolled balls of masa. 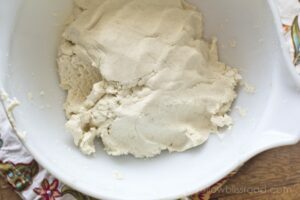 Once the masa is rolled into a ball, flatten it out slowly by pressing it in between the palms of your hands (like playdoh) but do not flatten completely just enough to give it a round look. Then with your fingers starting in the middle flatten out the masa outward turning the disc as you slowly move outward. The disc should be about half-inch thick. Then place on a heated Comal (flat griddle or skillet) medium heat. Heat the sope on both sides (approx 2 min on each side) pull aside let it cool (but not for too long, masa will harden) then pinch the edges to form a cup. Then follow the rest of the directions Ms. Kristin gave. Fry them, load them up with whatever toppings you choose and enjoy! Thanks for your tip Alicia! any idea what i may have done wrong? 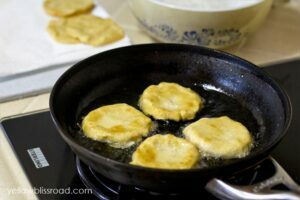 i lightly fried them in pam in a flat cast iron skillet, removed them, then added oil to the skillet as suggested below and added back in but they completely disintegrated within a few minutes. Hi Elizabeth, when Aceneth wrote Pam, I think she meant heat in a PAN first. I know her misspelled words were misleading. Heating the masa (disk) in a skillet or griddle first before you pinch the sides of the disk to form the cup. It’s best to not fry fresh masa because it absorbs too much oil. That is why we heat it up first. Chose this method over others. Made the right choice. Very tasty, easy to make, very happy wife. Added a margarita to ease it down with. Thank you. A “comal” is basically a round cast iron plate/ skillet. Shallow like a plate. and well seasoned is important with all cast iron. Do you think these could be made ahead of time and either frozen or refrigerated and them baked before a party? I haven’t tried this…I know they could be reheated and I’d definitely bake versus microwaving. We’ve been making these since I was a child. We in our Mexican home call them Chalupas de frijole. 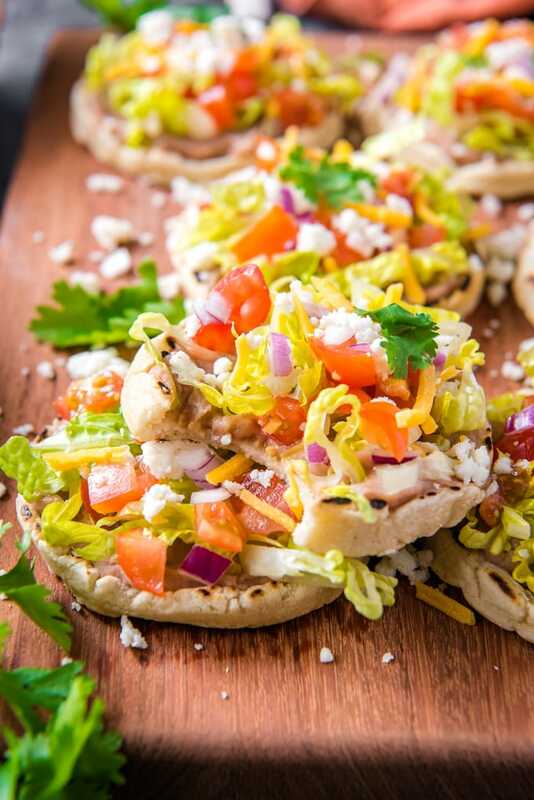 Bean chalupas. They are easy and delicious to make. Hi! 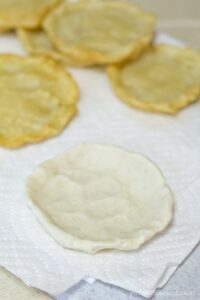 I am mexican, and want to raise the hand just for a little change that will blow your recipie, once you have the flat masa, dont put it on fan with oil, just add a little pam and let them cook, this will make your masa more soft and yumi. Then, while you are preparing the sope, i mean, while you are adding the frijoles and cheesee, you can add oil to the sopes to make them cruchy from the outside. In mexico we use a “comal” instead of a pan, but i am sure it will also work. Had some pinto beans to use up and came across this post…decided to try it. So simple…I mean, CRAZY simple. And so delicious. Thank you for posting.